On 13 May 2015 Article 36 and Reaching Critical Will hosted a side event to the Nuclear Non-Proliferation Treaty (NPT) on ‘Banning Nuclear Weapons’. Elizabeth Minor of Article 36 presented Article 36 and Reaching Critical Will’s new joint paper ‘Filling the legal gap: The prohibition of nuclear weapons‘ on current gaps in international law. She also highlighted the need for victim assistance provisions in a treaty banning nuclear weapons, and discussed new research from Article 36 showing the dire underrepresentation of low-income and non-western countries in multilateral nuclear disarmament forums. Ray Acheson of Reaching Critical Will presented the principles and provisions that should be included in a treaty to ban nuclear weapons, noting that the proposal for a ban treaty is the only real issue being discussed at this NPT Review Conference, and that support for such a treaty has grown considerably over the past two years. She emphasised that negotiations on a ban treaty should be open to all and blockable by none, and that the 70th anniversary of the atomic bombings of Hiroshima and Nagasaki is an appropriate deadline for the launch of a ban treaty process. I am going to talk through some of the gaps in international law related to nuclear weapons, which a ban treaty would address. There are a number of legal provisions, including treaties, that regulate different activities related to nuclear weapons – the NPT is one. But, unlike the other weapons of mass destruction, there is currently no comprehensive, explicit prohibition on the possession, production, transfer and use of nuclear weapons. There is a lot that is positive in the current legal framework, including the Nuclear Weapons Free Zone (NWFZ) treaties. And it is widely recognised that nuclear weapons pose serious challenges under a range of areas of international law. But, the legal framework could be strengthened: there are deficits in the regulation of many activities; the legal regime is fragmented, with prohibitions applying unequally across the world; and there is discrimination between states in the current regime, allowing some to undertake activities that are prohibited to others, even if they are party to the same treaty. Article 36 and Reaching Critical Will have produced a table on the legal gaps, laying out these deficits. This is not a comprehensive legal analysis – it is a summary tool for states and organisations that are working to address the legal gap with respect to the prohibition and elimination of nuclear weapons. Currently, all NWFZs, which cover 60% of UN member states, ban the production of nuclear weapons by their states parties. Non-nuclear-armed parties to the NPT are prohibited from manufacturing nuclear weapons. Nuclear-armed states parties to the NPT however are not prohibited from assisting each other in manufacturing nuclear weapons, and non-nuclear armed states parties are not prohibited from assisting them either. There is also no specific prohibition in the NPT on the modernisation of nuclear arsenals, including the improvement of weapons systems – though such activities arguably run counter to NPT article VI on ceasing the arms race and achieving disarmament. Nuclear testing is banned in all NWFZs, by the Partial Test Ban Treaty, Antarctic treaty, and Comprehensive Test Ban Treaty (CTBT), and would also likely be prohibited under states’ obligations to respect the right to health and International Environmental Law. The CTBT however has not entered into force and does not explicitly prohibit subcritical or other non-explosive testing. Acquiring control over nuclear weapons is prohibited for parties to NWFZ treaties and for non-nuclear armed states parties to the NPT. However, the transfer of nuclear delivery systems is not prohibited by the NPT. And, nuclear sharing agreements between the US and some NATO countries, under which nuclear weapons are stationed in certain countries with the expectation that they assume control over them at times of war, were not prohibited by the NPT – although some argue strongly that they are incompatible with it. The transit of nuclear weapons is also not prohibited by any treaty. On stockpiling and possession, two NWFZ treaties prohibit stockpiling, and there is an obligation under article VI of the NPT to pursue negotiations in good faith for effective measures on nuclear disarmament – as noted in the advisory opinion of the International Court of Justice on nuclear weapons, this means reaching an agreement. Possession is prohibited to NWFZ states parties and, arguably, is implicitly prohibited for non-nuclear-armed NPT states parties. However, it is not prohibited for nuclear-armed states parties to the NPT – this is the most significant example of discrimination in the current legal regime. Just to note that a prohibition on possession or stockpiling in a treaty banning nuclear weapons or any other instrument would not be a barrier to nuclear-armed states joining however – it would simply mean those states placing themselves under a clear obligation to disarm. Currently, the only prohibitions for stationing nuclear weapons relate to the international seabed, space and the Antarctic. The deployment of nuclear weapons is prohibited in NWFZs, but not by the NPT or any instrument. There is also no explicit treaty prohibition on the use or threat of use of nuclear weapons, though it is unlikely that any use of nuclear weapons could comply with International Humanitarian Law, and would also likely violate International Human Rights Law, International Environmental Law and other branches of law. The NPT does not explicitly prohibit states from subscribing to the doctrine of deterrence, which requires the possibility of using nuclear weapons, and making preparations for their use. The NPT also does not prohibit consultation or planning on the use of nuclear weapons, such as by NATO (whose nuclear planning group includes both nuclear armed and non nuclear armed states). Again though, it is important to note that there are strong arguments that these activities are incompatible with the NPT. Existing provisions on assistance with prohibited acts in NWFZ treaties and the NPT are uneven, and again don’t apply equally to all states. Nuclear-armed NPT states parties are not prohibited from assisting each other or other states not party in producing nuclear weapons. There are no explicit prohibitions on financing nuclear weapons systems’ maintenance or modernisation – this means that companies in non-nuclear armed states are contributing to the modernisation of nuclear arsenals. Finally, on positive obligations. A range of international rules and regulations describe the rights of victims and survivors of violence with regards to assistance, redress, and justice, and the restoration of affected environments. However, as has been recognised by over 100 states that have endorsed the Humanitarian Pledge, the rights and needs of many victims of nuclear weapons explosions and testing have not yet been adequately addressed. There is no international legal instrument that gives a specific framework for survivors of tests and the atomic bombings of Japan to collectively seek assistance from their governments towards the full realization of their rights, and there are currently no specific international obligations to decontaminate or remediate areas affected by nuclear weapons detonations. Victim assistance provisions would likely address ongoing negative health effects, social and economic marginalisation, decontamination and the rehabilitation of communities, and transparency on past use of nuclear weapons. Including victim assistance in a treaty banning nuclear weapons would likely involve creating specific obligations on states to ensure the realisation and enjoyment of the full range of rights that victims have, and structures for international cooperation and support between states parties to achieve the fulfilment of their responsibilities towards their populations.Development of victim assistance provisions should also be inclusive of survivors, and ongoing treaty processes should offer them a collective voice. Including victim assistance in a treaty banning nuclear weapons would bring such a treaty in line with, and would build on, developments over the last two decades in the international legal framework to respond to the rights of victims and survivors of violence. The rights of victims should be an integral part of a prohibition of nuclear weapons that is based on unacceptable humanitarian consequences. Acknowledging these rights does not imply that an adequate humanitarian response could be mounted to any nuclear explosion, as one could not, but that states have responsibilities towards their populations that they must fulfil. Though a legal framework on victim assistance alone would not guarantee adequate assistance, it would strengthen the position of survivors to have an explicit recognition of their experience. It should however also be considered, in developing victim assistance provisions, that some states with particular obligations to the survivors of nuclear explosions may not be present at initial negotiations. Negotiations on a treaty banning nuclear weapons should be open to all states, whilst not relying on rules of consensus that can allow processes to become blocked. Requiring consensus, when used for effective veto, does not amount to ensuring open inclusion. On the subject of global representation and inclusion in multilateral discussions on nuclear disarmament: data on attendance and individual statements at nuclear disarmament forums that Article 36 has been analysing for a project on disarmament and development shows that, as many of us already know, low-income countries are seriously underrepresented in all current international discussions, and that the higher a country’s income, the more likely they are to be vocal on these issues. This is significant as nuclear disarmament is a global concern. Also, patterns such as the fact that the great majority of low-income countries are members of NWFZs, whilst many high-income countries depend on nuclear alliances in their defence doctrines, suggest the overrepresentation of certain positions in current international discourse. The pattern on regional representation also suggests this. We should recall that the majority of states reject nuclear weapons, and the action and leadership of non-nuclear armed states will be key to banning nuclear weapons. Future processes must be mindful of ensuring more equal global representation: including through the meaningful involvement of civil society, international organisations, and survivors as well as more equal participation between countries. To conclude, the are clear gaps in the international legal regime with respect to the prohibition of nuclear weapons. 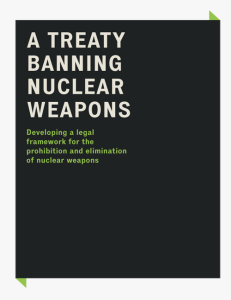 A treaty banning nuclear weapons would build on and help to reinforce existing legal instruments and their provisions, some of which I have briefly described. The current patchwork of obligations hampers the development of a clear normative recognition that nuclear weapons are inherently unacceptable. However, they give a clear basis to build on in order to codify the illegitimacy of nuclear weapons, through a comprehensive, non-discriminatory treaty banning nuclear weapons.